Everything is so much easier when you are winding a yarn from a skein or a hank using a yarn swift. A yarn swift allows you to effectively wind yarns into perfect balls. When you have this tool, tangling the yarn is out of the question. 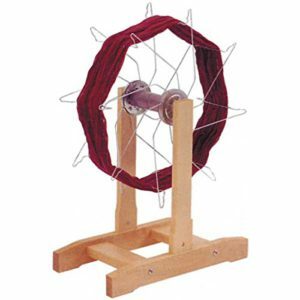 Although you might prefer yarn ball winders, if you want to get yarn cakes, a yarn swift is better suited for the task. 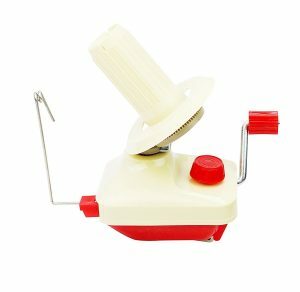 Are you looking for a Yarn Winder? Here’s a list of our Best Yarn Winders. These swifts are available in a number of models, but how do you know which one is the best? Read on for the top ten best yarn swifts and a guide to everything you need to know before making the purchase. 13.1.1 Different styles of yarn swifts. 13.2 Do You Need a Ball Winder? 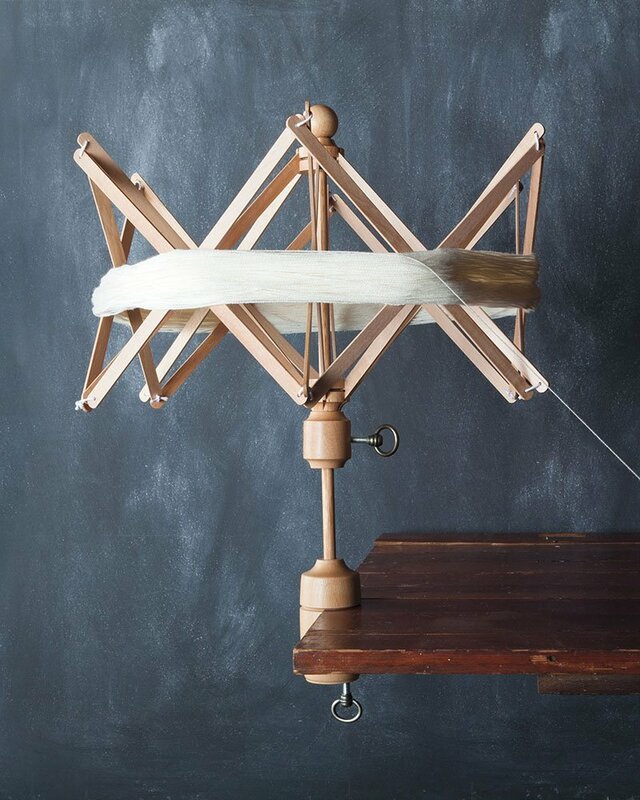 The Stanwood Needlecraft Tabletop Amish Style Wooden Yarn Swift is built from solid wood. It has been polished by extra fine sanding to a super smooth finish. The touch ensures that your yarn will never be snagged. Being free of toxic varnish fume, it is safe and one of the best you could ever buy. The style of this yarn wood is Amish. What this means is that it can fit several skeins, even the large ones. You can make it smaller if you wish, but the only problem is where to sit. You have to pick a strategic place to sit and place for if you try to pick it up, it might come apart. 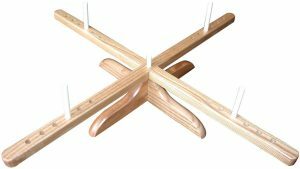 The adjustment of this yarn swift can be done simply by moving the pegs to accommodate several sizes of skeins. Its bottom comes with two pairs of non-slip pads to hold it firmly on the table. It is easy and convenient to store. You can take the pieces apart and carry or store them. Although space might limit you, one thing is for sure. It spins smoothly and your winding is much fun and easy. Like the Amish style yarn swift, this particular model features a wooden make with a fine touch. It boasts smooth spins and the winding process comes easy. Its craftsmanship is top notch, and with the quality construction, it is deemed to last long. If what you are looking for is something that will aesthetically please you, look no further. 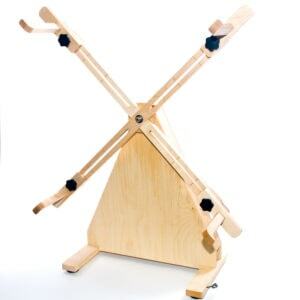 There are variations to Stanwood Needlecraft Wooden Umbrella Yarn Swift Winder, this model is the medium sized type. It can hold skeins that are up to 6 feet in circumference. Bigger than that, you should consider the large size. It features a clamp on the base, for fixing purposes. It holds well on benches, chairs, and tables among others. One quibble is about its clamp screw. Sometimes it tends to crack, making stability and smooth spins an issue. Luckily, you can purchase screw replacements to solve the issue. Also, the rivets holding the arms together come loose. This has been noted by several users. 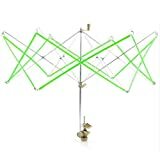 The Premium Knitter Yarn Swift Umbrella Wooden Yarn Ball Winder is perhaps the most versatile and durable model of a yarn swift on the market today. It can comfortably suit almost all sizes of hanks. With a high-quality make of birch wood, you can tell that it was made to last. The yarn boasts an ergonomic design with an umbrella style. This is ideal for the accommodation of several sizes of hanks. It is held down by thick screws to ensure that wherever you place them, it grips firmly, saving you the inconvenience of having to start all over again. The yarn swift offers you a fun and smooth experience, whether you are using a skein or a hank. It can be folded into a compact design for storage or carrying around. It has a squeak-free rotation that saves you time as you wind your yarns. The only problem some users have encountered is that the screw holding all the pieces together often comes loose. Others claim that it is a bit tight, that is, it doesn’t spin easily. Some wish the screws were made of metal. The ChiaoGoo Amish Design Wooden Yarn Swift is a tool that features a smooth finish. It promises quick and fun winding of yarns. The swift is big enough to ensure that even large skeins can comfortably fit. The maximum circumference is 62 inches, which is sufficient enough for most of your applications. The yarn, being an Amish design, makes it even better suited for large skeins. The adjustable pegs allow you to adjust them according to the size of the of the hank. The whole unit can be easily set up on a table for the process to be flawless. It doesn’t have any clamps and it can be placed flat on the floor or the surface. The non-skid pads on the bottom of the fixture ensure that it doesn’t slip or move as you wind your yarn. 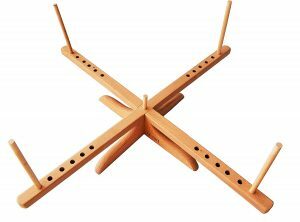 The only disadvantage to the ChiaoGoo Amish Design Wooden Yarn Swift is the design. It doesn’t fold down for storage or portability. However, some customers have found that the process of dismantling it is effortless. Other than that, it is a recommended product that you should own. If you are scouting for one of the best yarn swifts you can use on the go, the U-nitt Wooden Yarn Swift is all you need. With this swift, you can say goodbye to using your feet to hold the hank. The process is slow, but with this tool, the smoothness and rotations it offers will make it a thing of the past. The swift is made of solid wood and is finely sanded for the best smoothness and fun process. It is safe to use as the sanding was done without any harmful materials. Setting it up is fairly easy compared to other models on the market. The adjustable circumference lies between 34 inches and 60 inches. This means it can be used for several types of hank for your yarn. 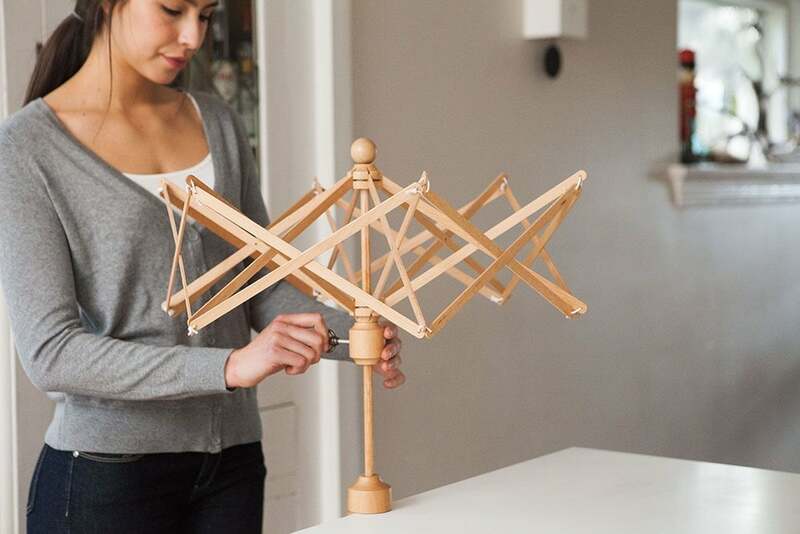 You can set the unit on a table and get it spinning with ease as you wind your yarn. You can also use it with a ball winder for even better results. Despite guaranteeing utmost satisfaction, the unit is wobbly. Many users have complained about this setback, but considering the cost, the functionality, and the simple design, anyone would recommend it to you. 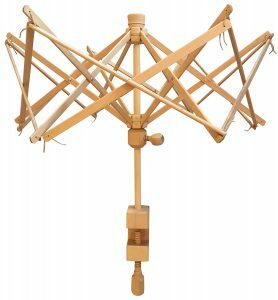 The only difference between this model and the other Stanwood Needlecraft Wooden Umbrella Swift Yarn Winder is that it is large. The make is a solid wood design with a finely sanded finish. Everything about it is smooth and fun. If the small size couldn’t do what you desired, this will do. It can hold skeins of up to 8.5 feet in circumference. The swift sits stably on a table or a chair with a clamp on base. For this reason, you can easily set it up on the edges of the surface you desire. The metal tying wires have been designed into small holes to keep you and the yarn safe. Your yarn is safe from breakage. Its umbrella style gives it a touch of elegance and it can open very wide for various applications. The Stanwood Needlecraft Wooden Umbrella Swift Yarn Winder works great. It is strong and durable. Although others might find it too large for some applications, it comes highly recommended. You might not also like the hemp ties that hold the arms together. It often breaks, making them all loose. The Knitpicks Yarn Swift is a great addition to any crocheter or knitter. It is made of strong wood and for extra longevity, some metal components have been incorporated into the design. Metal screws come with plastic stoppers to ensure that there are no scratches when you clamp the fixture on a surface. It is versatile enough to hold yarns of various circumferences from 26 inches to 68 inches. Coupled with this is the umbrella design, which makes it even more convenient. Umbrella clamp can comfortably hold various diameters. It is simple to use and it spins smoothly, making the whole idea of winding the yarn time saving and suitable for various purposes. Although the KnitPicks Yarn Swift has an ergonomic design and is highly durable, moving it up and down might be a challenge. As such, you might need to use polish, wax, or whatever works for you to ensure that the process is flawless. You should seriously consider this particular yarn swift if you are looking to save space. Umbrella designs are better than tabletops. The KnitPicks Yarn Swift is flexible even on unique yarns. You also don’t have to worry about redoing hanks. The yarn swift features a make of both plastic and metal, which is both an advantage and a disadvantage. Some users have complained that the metal loops catch the yarns at the end of the swift’s arms. Similarly, the clamp isn’t as smooth as you would want it to be. It leaves some marks on the surface it is placed on. On the brighter side, it lasts long and the rotational process is smooth. This spinning action saves you time as you wind the yarn and the tension is kept stable. The yarn swift works well when clamped on a table or a chair and is foldable to a small and a compact design for easy storage. It can accommodate a one-yard skein. The Windaze Knitting Umbrella Yarn Swift features a material design of plastic and alloy. What this means is that you will get satisfactory service for long. It is versatile and can be used to wind several types of strings effortlessly. The unit is a machine for the hand-operated winder, which makes it convenient, but will take some time to get used to. Any enthusiast of crocheting and knitting would recommend the product. It makes winding of the yarns as well as other strings into balls better and much easier than telling someone else to hold it for you. It features a clamp-on base that can be attached to table, chairs, benches and other surfaces firmly. Despite its amazing features, it has setbacks too. The alloy ends catch the yarn and may lead to entanglement. Also, the yarn swift comes in pieces and you are tasked with putting it all together. Considering there are no instructions that come with it, it might be quite challenging. But in all fairness, it compactly folds for easy storage. It also makes perfect yarn cakes. This is another yarn swift product that is made of durable plastic and alloy, which is a guarantee of durability. It has been specifically designed to meet all your winding needs. It can be used for a variety of uses and is ideal for several sizes of yarns and easy balling off hanks. The maximum circumference of strings it can support is 60 inches. The Lacis Swift Yarn Winder comes with table clamps for increased performance while fitted on a table, a chair, or any other surface. Stability is further enhanced by wooden screws that ensure it holds firmly in place. This also allows the yarn and swift to make rotations smooth as you wind your skeins. It doesn’t come with a ball winder. The swift also features an integral handle that you can use as a winder. The instructions that accompany the purchase allows you to quickly get it working in no time. However, some users have a few complaints. The metal loops that hold the plastic components for the yarn occasionally gets hung on the loop, which could be a nuisance. Adjusting the fixture up and down also takes a while. A lot of people say it looks like a steampunk Ferris wheel. It is actually a Japanese design, that’s based on industrial swifts. It’s very smooth and especially good for fine yarns, like lace weight yarn, or more delicate fibers. But I’ve used it for all different weights of yarn and content. I mostly use it for sock yarn that’s wool or wool blend. This Traditional Japanese winding tool is excellent for winding silk and delicate yarns. Holds Skeins 57 – 64in. in circumference. What I really like it for is re-skeining. What I mean is that if I wind a hank of yarn into a ball thinking that I’m going to start a project with it, but then for whatever reason the project doesn’t get off the ground or I end up frogging the project, then I use the Goko to re-skein the yarn back into hank form. 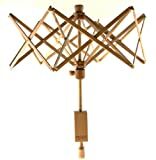 The Goko consists of a wooden base, with two arms extending upward. It weighs six pounds and can sit on the table or on the floor. At the top of the wooden arms are slots into which the metal wheel is inserted. The wheel itself is made from aluminum and it is a bit fragile, I mean it could easily get bent out of shape, if it were dropped or handled roughly. So you do have to be a little careful with it. On the other hand, the lightweight flexibility of the thin metal is part of what makes it work so well. To use it as a yarn swift, you remove the wheel and place the open hank around the outside of the wheel. The wheel is adjustable, but not as much as the other types of swifts. 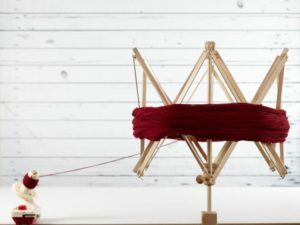 The Goko can only be adjusted to hold skeins with a circumference of 57 to 64 inches, which is what, four and a half feet to a little over five feet? So its adjustability is a lot more limited than the others. To adjust it, you just loosen the bolts on the side of the wheel and then turn the side panels, which in turn makes the arms of the wheel kind of shrink in or expand outward. So you can see it does adjust a bit, but not a lot. Storage is an issue with this swift, it does not break down in any way to fit into a smaller space for storage. So like with the Amish style swift, you do have to figure out a place to store it. But I know some people like to leave it out because it’s interesting looking and adds character to their craft room. 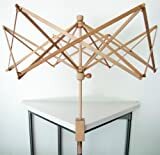 Now the Goko is not as common as the umbrella swift, or the Amish table swift, at least I haven’t seen it mentioned a lot in the knitting world. I do like mine and have used it quite a bit. 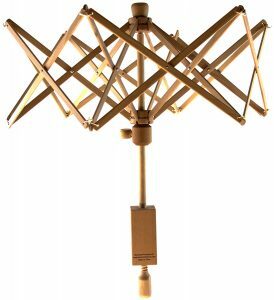 Like I said, I do use it for re-skeining a lot, because it’s easier to spin this lightweight metal wheel than the wood umbrella swift. Different styles of yarn swifts. 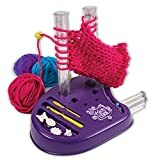 I’m sure most of you already know that a yarn swift is an adjustable device, upon which a hank of yarn is placed, in order to wind it into balls. It’s often used in conjunction with a ball winder, which creates center-pull balls or cakes or I like to call them “little yarn muffins”. Or you could use the swift to hold the yarn while you wind the ball by hand. Now the word swift comes from the old English word for revolve and it also has ties to the old Norse, with the same origin as the word swivel. So swivel and swift. So the yarn swift swivels around, either horizontally or vertically and makes it easier for you to handle the yarn. The swift is only needed when the yarn comes in hank form, meaning that the yarn is in a big loop and it’s really hard to knit from, until you wind it into a ball. If you’ve ever tried winding a yarn ball without a swift, you know how challenging that can be. You have to use the backs of your dining room chairs, or have somebody hold the hank of yarn for you, otherwise it will become a horrible, tangled mess. Now when the yarn comes in hanks, the loops of yarn are often in different sizes. Some, like this one are smaller circles and some are larger. So compare these two. Now you can see that they’re, one’s much smaller than the other. Now some hanks might be as small as a 36 inch circumference, while others might be larger, up to 120 inches in circumference and that’s a huge difference. It seems like a lot of hanks are around 48 to 60 inches in circumference, but there’s definitely a lot of variability in sizes. So it’s imperative to have a swift that will adjust to the different hank circumferences. The most common yarn swifts I’ve come across, are the umbrella swifts. These can be made out of wood or metal and they usually will collapse pretty flat for storage. But when you wanna use them, you place the circle of yarn onto the closed yarn swift and then open it until it’s holding the circle of yarn up. You open the yarn swift similarly to an umbrella, pushing the tightening screw upward, along the center spindle, so that the ribs expand and hold the open hank of yarn in place. Then secure in that position, by turning the tightening screw. So the umbrella ribs adjust to the size of the hank. It will be thinner, or on smaller circumference skeins, and wider on larger circumference skeins. You can get umbrella swifts that have a flat base that sit on top of a table, or they have a clamp which can be attached to the side of a table. I’ve even seen a few that are tall and stand on the floor. Now my umbrella swift is a middle of the road model. It is a Stanwood, which is made from finely sanded birch wood. It’s a large size, which can handle skeins up to eight and half feet in circumference. The ribs of it are tied with hemp cord, which is pretty much like every other umbrella swift. Mine has a clamp-on base, which allows it to be firmly fixed at the edge of a table, chair, bench, or any surface up to one and 3/4 inches thick. This swift is really big and needs a lot of space to spread out. Stanwood also makes a medium sized umbrella swift, which is smaller and can handle hanks of yarn up to six feet in circumference. 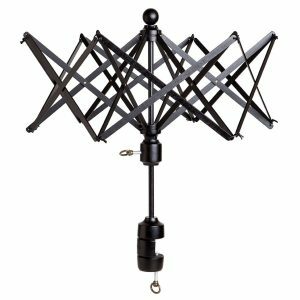 So if you’re limited on space, you might want to assess the amount of room you have, to set up one of these umbrella swifts. Another idea is that you can anchor the clamp onto something like the back of a chair, so that the swift turns vertically and that might work better for some people. Overall, umbrella swifts can be very inexpensive, to very expensive. I’ve seen some low cost ones for like $20 and other luxury brands that use beautiful, exotic wood, for hundreds of dollars. The more economical ones tend to be suitable only for very light weight yarn and smaller circumference hanks. They’re not as sturdy as the ones you pay a little more money for and I’ve heard that people have had problems with them breaking. 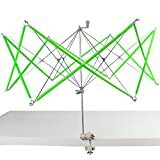 Now mine cost around $50 and it’s sturdy, it works just fine for my home use purposes. If I had a yarn shop, I’d probably invest in something more higher end, but I have not had any problems with it and I’ve been happy with it. Okay, so that is the umbrella swift. Now another style of swift that seems to be gaining in popularity, is the tabletop, or Amish style swift. 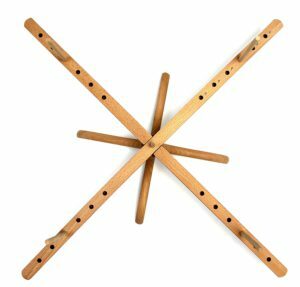 This type of yarn swift is made from wood and consists of two long, thin pieces of wood, that crisscross in the middle, creating four arms. On each of these arms is a series of holes, into which pegs can be inserted. And these pegs delineate the circumference of the hank of yarn. So there are different holes, so that the pegs can be moved to accommodate different sizes of hanks. And then the whole thing spins around, allowing you to create yarn balls or muffins. One nice thing about the Amish swifts is that if you, or someone you know are handy with wood-working, you can fairly easy make one yourself. In fact, this is my first yarn swift, it’s an Amish style swift that my husband made for me. He found some instructions online and whipped this up in a couple of hours. I’ll try to find those instructions or something similar and put a link below, so you can check that out. So this swift didn’t cost much at all, just a few dollars for the pieces of wood and a bolt. Even if you buy an Amish swift, they are often less expensive than the umbrella swifts. Of course there’s still a price range, but for example, you can get a Stanwood for about $25, which is half the price of my Stanwood umbrella swift. The way you use an Amish swift, is to put it on top of a table or a flat surface and spread the hank of yarn out across all four arms. Adjust the pegs so that they’re holding the yarn fairly firmly. Then of course cut the piece of yarn, holding the hank together and then find the end and start making your yarn ball. Now the thing you probably need to think about if you’re considering an Amish swift, is where you might store it. Maybe you would just leave it out all the time, but if you need somewhere to put it away, be aware that they can take up a lot of space. Some of the Amish swifts are able to be dismantled for storage, but some are not. So storage is one issue with this kind of swift. If you can’t take it apart, you’re gonna need a space wide enough to accommodate the arms. And mine does not come apart, so that has been a challenge to make space to store it. So that is the tabletop, Amish style swift. The last style of yarn swift I’m gonna talk about today is a vertical swift. I’ve already mentioned that you can use your umbrella swift vertically, but there are some swifts that are specifically made for holding the yarn hank vertically. In doing a Google search, I’ve found that there are a lot of handmade vertical swifts of various designs available for purchase. A lot of these seem to be used by dyers, who hand dye yarn and buy their yarn in cones and then need to wind the yarn into hanks. 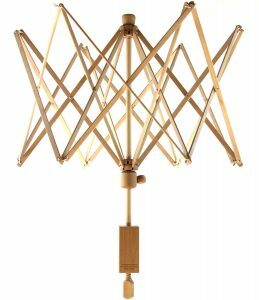 Some of the styles include the squirrel cage, which runs from about $120 to around $250. 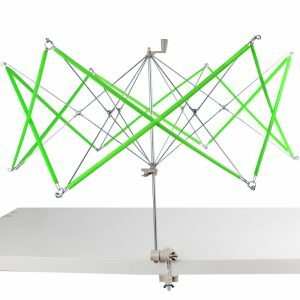 The heavy-duty skein winder from Crazy Monkey, which can cost up to $1,000, depending on what features you get. And a simpler version of this, that you can get on Etsy for $85. The vertical swift that I have is called a Goko swift and it is made by the Schact company. I purchased my Goko swift from The Woolery online a couple of years ago. I just looked and the current pricing is around $150. Now I have seen DIY versions of this type of vertical yarn swift. People have made them out of PVC pipe and even Tinker Toys. I’m not sure if I’ll be able to find specific instructions for those, but if I can, I will put links below. Because that would be a savings if you’re looking for economy. But if you’re interested in something different or smoother than other swifts, or maybe an easier way to re-skein yarn, that doesn’t cost as much as some of the other re-skeiners out there, then the Schahct Goko swift might just be right for you. Do You Need a Ball Winder? Whether you need a ball winder to use with the yarn swift is another significant factor to consider before making the purchase. But, why would you need a ball winder? If you need to save lots of time, then you need a winder. It will allow you to make a perfect center pull yarn cakes. The process is much simpler, clean, and fun! One thing though, ensure that the ball winder you get is compatible with the type of yarn swift you have. You should also know how to use the combination without damaging the yarn. The most popular types of yarn swifts are the wooden styles. They are mostly made of birch wood, for durability and easy handling. Wooden yarn swifts are also lightweight and can be stored easily. They feature fine polishes and few metal components like screws for better performance in terms of spinning and winding. Although wooden yarn swifts are durable, the plastic types with metal alloys give them a run for the money. These types fold compactly into small designs for easy storage. The only problem is that most of them will have the yarn getting caught on the loops. This might be an unpleasant distraction for any knitter. While the two have different benefits and limitations, some have been designed to meet the exact specifications and the quality you desire. Quality is a vital thing to look at. You don’t want something that is cheaply made. It will only last you a few uses before it gets broken. The workspace you use to knit or crochet or simply wind the yarn shouldn’t be disregarded. Don’t let the design fool you. Folded, the umbrella design might consume lots of space when opened. The Amish styles are no better. They take up lots of space, especially the ones used to hold large sizes of strings. Pay close attention to the ease of setup of the whole fixture. It might get challenging for first-time users. How smoothly the wooden design is finished is another thing. Ensure it is finely sanded to keep you and the yarn safe during the process. Whether it is adjustable for different circumferences entirely depends on your specific application. Before my friend gifted me the yarn swift, I had been either having the yarn wound at the yarn store or winding it by hand. When I discovered that winding hanks into balls and letting them sit for long periods of time could cause them to stretch out, I only had the yarn store wind my yarn if I planned to use it immediately. A yarn swift makes winding by hand so much easier. 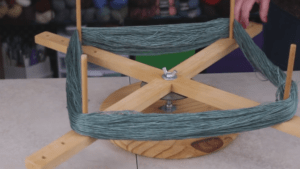 Instead of having a friend hold it or wrapping it around a dining room chair, the yarn swift holds the yarn nice and taut, spinning around as you pull the yarn. If you need to take a break from winding, you merely put down the ball you’ve wound so far and returned to it later. The swift holds everything right where it should be. Pair that yarn swift with a ball winder as I did, and you’ll be in heaven. Setting up a yarn swift is simple. Your swift probably has a mount, and you can attach it to anything from a countertop edge to a dining room table. I also like to wind yarn outside on the porch. The swift I recommend to use is the yarn swift from KnitPicks, To mount it, I place it on edge, then twist the metal screw until the swift feels secure. Unwrap the hank of yarn and remove the label, if it has one. The yarn should form one big circle. Don’t untie it just yet! Place the circle of yarn around the yarn swift and hold it as you open the swift like an umbrella. Push up on the centre of the swift until the hank is taut. You don’t want a loose yarn swift. Otherwise, the yarn could fall right off. Secure the swift by tightening the screw on the side. You’ll notice that the hank of yarn is held together by small bits of yarn. Some hanks have only one, while others might have three or even four. Remove these bits of yarn. The rest is easy. Grab one end of the yarn and start winding it either onto a ball winder or your fingers. As you pull, the yarn swift will turn, all the while holding the yarn in place. One note here: Be sure the end you’re pulling from is on the outside of the swift. Pulling from the end of the yarn that’s laying on the inside of the swift will interrupt the flow of the swift and make pulling the yarn much more difficult. Keep winding until there’s no more yarn on the swift. One thing that stopped me from buying a yarn swift in the past was the storage. Where on earth would I put such a huge tool? If I had checked into it more, I would’ve realized that yarn swifts are collapsible! My yarn swift even came with a neat little produce bag so that I could slide it inside. It’s small enough to fit in any closet, bag, or even in under-the-bed storage. Don’t want to spend a lot of money on a yarn swift? Try to find a used one or try winding your yarn by hand. Are you still unsure of which type of yarn swift to choose? You shouldn’t be. Pick either of the above-reviewed products and you are good to go. The list consists of both wooden and plastic/alloy types. Similarly, it covers the best of the two worlds, the umbrella, and the tabletop designs. If you have a specific type of swift that isn’t covered, the guide on what to look for will suffice. I hope you’ve enjoyed reading an overview of the different swift styles that are available. Did you see anything that was new to you? And of course I’m interested in what kind of swift you like. What do you use? What have your experiences been with the swifts you’ve used? Good? Bad? Ugly? Or are you in the market for a new swift? And in that case, which of these styles appeal to you the most? Or maybe you’ve seen something else, I would love to hear from you. Please let me know your thoughts in the comments section below. Also, please feel free to comment if you have any questions about. Or if you have an idea for what you’d like to read on future posts. Or if you’d like to read a product tested. Leave your suggestions in the comments section below.